In other words, even as political risks in Italy surged in the Spring and Summer of 2018, causing the yields on Italy’s 10-year bonds to rocket by as much as 50%, French banks increased their holdings of Italian debt by over 10%, once again belying the ECB’s long-held claim that its QE program would help reduce the level of interdependence between European sovereigns and banks. And the €311 billion figure from Q3-2018 doesn’t even include the French banks’ exposure to derivatives contracts (€11.2 billion), guarantees (€16.2 billion) and credit commitments (€46.3 billion), which add up to an additional €73.7 billion. If you include all that, the total exposure of French banks to the Italian economy is €384.7 billion — the equivalent of 17% of French GDP. France isn’t the only Eurozone nation with unhealthy levels of exposure to Italian debt, although it is far and away the most exposed. According to the Bank for International Settlements, German lenders have €87 billion worth of exposure to Italian debt — up from 79 billion six months ago — and Spanish lenders, €75 billion — up from €69 billion. If you include derivatives, guarantees and credit commitments, German lenders are exposed to the tune of €126.53 and Spanish lenders, €89 billion. In other words, taken together, the financial sectors of the largest, second largest and fourth largest economies in the Eurozone — Germany, France and Spain — hold no less than €600 billion of Italian debt, derivatives, credit commitments and guarantees on their balance sheets. It’s perhaps no wonder Le Marie is worried about Italy’s economy. He’s not the only one. The European Commission is expected to warn next week that the Italian government’s spending plans will do little for long-term growth, with the proposed lower retirement age and the “citizen’s income” for the poor coming in for particular criticism. The government’s program makes Italy “a factor of contagion risk for the entire euro area,” the Commission’s annual report is expected to conclude. 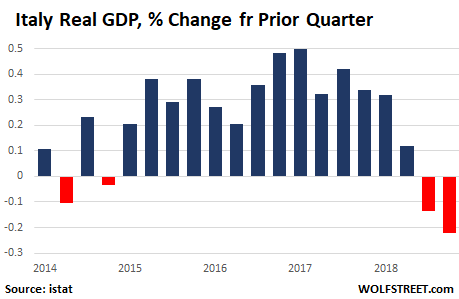 But there’s not much Brussels, Berlin or Paris can do about it, even as the Italian economy slides into a technical recession for the third time in a decade. Italy’s government is perfectly cognizant that French, German and Spanish banks are now far too exposed to Italian debt for their respective governments to even entertain the idea of pushing Italy to the edge. That knowledge is fueling the coalition government’s bravado, with some lawmakers now even talking about nationalizing Italy’s central bank, the Bank of Italy, for a total sum of €155,000 and taking control of its assets, including Italy’s large pile of gold. While the draft law stands little chance of being approved, it underscores just how far removed Italian politics currently are from the Brussels-approved status quo. Yet the more the Commission tries to bring Rome into line, the wider the spreads on Italian bonds tend to grow, which in turn forces Italian banks to cut their lending. This risks deepening Italy’s economic slowdown, which would put even further strains on Italy’s fragile banking system. And that’s the last thing that France’s government or its banks want. By Don Quijones.